Multiple Mobile Alerts to pass a bill! This chart illustrates why people receive multiple mobile alerts on a bill. 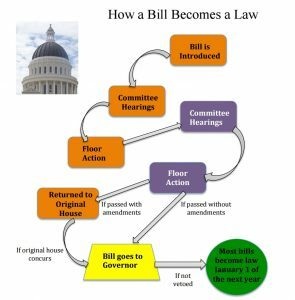 In California, two houses (the Assembly and the Senate) must both approve a bill before it reaches the Governor. Legislative committees in both houses study and vote on the bill. Plus, the full membership of each house votes on the bill. Prior to these votes, nonprofits issue mobile alerts for people to message the decision-makers.